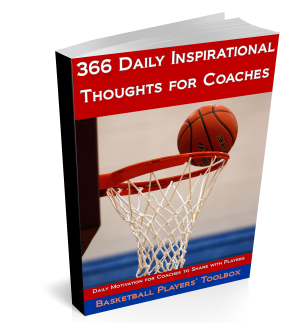 These are 45 of the 366 thoughts for basketball coaches to share with players that I have compiled. Proper form and a strong work ethic plus preparation and repetition is the formula that makes a great shooter. Good teams and players give second efforts, great teams give 3rd, 4th, and 5th efforts. The only way for an individual to improve is to work at an uncomfortable pace in practice and during the improvement season (April-September) If you aren’t uncomfortable, chances are you aren’t improving. Contact from the defense is never an excuse to lose the ball. Expect to get hit hard when you take the ball to the basket. Don’t get upset. The best revenge is making the free throws. A player’s goal every practice and every improvement season skill workout should be to improve yourself for the benefit of the team. “Don’t mistake routine for commitment.” Tommy Amaker. Don’t just show up, but give it everything you’ve got, every single time. Your energy level is controlled by your thoughts. The best offensive players have ball in their hand as long as they need to…not as long as they want to. It takes 21 days of conscious repetition before anything becomes a habit. The best way to improve your shooting percentage is to take better shots. Life is like a bucket of water. We are a part of the whole. But how big is the hole that is left when we take away a large cup of water? The hole suddenly fills up and…so life goes. The nature of life is that there is always someone who can and will take your place, when you think you are irreplaceable. his is a story about four people named Everybody, Somebody, Anybody, and Nobody. There was an important job to be done and Everybody was asked to do it. Everybody was sure Somebody would do it. Anybody could have done it, but Nobody did it. Somebody got angry about that, because it was Everybody’s job. Everybody thought Anybody could do it but Nobody realized that Everybody wouldn’t do it. It ended up that Everybody blamed Somebody when Nobody did what Anybody could have done.